Why Spend Time In A Simulator? The simple answer is “Most of the small helicopters in the air cost close to $2,000,000”. Emergency flight procedures are part of the FAA requirements for licensing pilots, but what about after 500 or 1000 thousand hours of flawless flight? Effective emergency procedures are instinctive and habitual, but they must be practiced to remain effective. Company and private commercial pilots can maintain life saving habits and nurture muscle memory in a machine that not only represents true flight, but it is also a fraction of the cost. 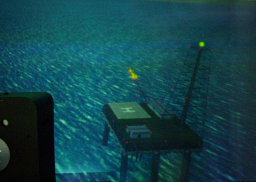 An Astar consumes approximately 34 gallons of fuel per hour, our simulator costs less, burns zero fuel, requires no maintenance, and there is no risk to the helicopter when practicing emergency procedures. Students use the simulator in the same fashion, however they are building the skills that veteran pilots are trying to maintain. Some students (see testimonial below) use the simulator to go through their last lesson skills while preparing for their next lesson. 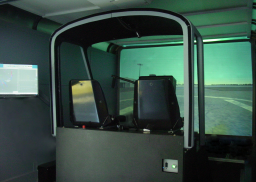 The simulator can be a method of relaxation before a flight. Simulator hours count toward limited portions of the FAA requirements for all licenses. The Frasca TruFlite HTM Helicopter FTD is configured to represent a light single piston engine powered helicopter. 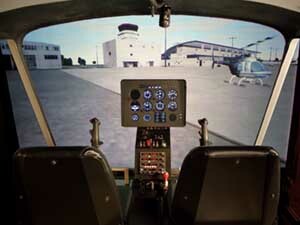 The panel configuration is similar to that of a Robinson R44. 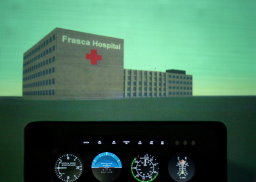 Using Frasca’s recently developed TruFlite technology, it is possible to change the performance of the simulated aircraft to approximate that of the R22, R44 and Schweizer. The cyclic control is configurable between the Robinson T Bar configuration and a conventional two stick arrangement.